Bringing an indoor fountain into a space is an easy way to create a calm, soothing atmosphere. Indoor fountains have become extremely popular for high end homes and commercial properties. They bring an organic vibe to an otherwise harsh or cold space. You can further enhance your space by adding other organic elements that create warmth and an inviting atmosphere for clients and guests. Many green plants require limited sunlight and watering. This means they are low maintenance plants for employees to care for. Many green plants only need subtle sunlight, so even if you’re in a space with limited windows, the plant will grow nicely. Always check with the local nursery or the site from which order the plant for the specifics on caring for that particular species of plant. 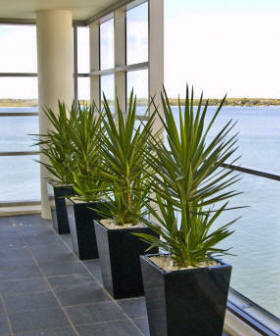 Green plants lend organic color to a space and work well with indoor fountains and water walls. Because you’re adding texture to the space with an indoor fountain or water wall, you can stick with fairly neutral colors. Colors like gray, stone, ivory and slate blue all work nicely with water walls. You can also reach for shades of blue, ranging from cobalt to baby blue. Blue is known for achieving a calming effect for people. Layering textures is important when you are sticking with a neutral color palette. Remember the key is to have your space read as organic and elegant – not boring and stiff. We talked about layering textures with neutral rooms. This includes plants, flowers, bamboo and anything else that can add depth to a room. 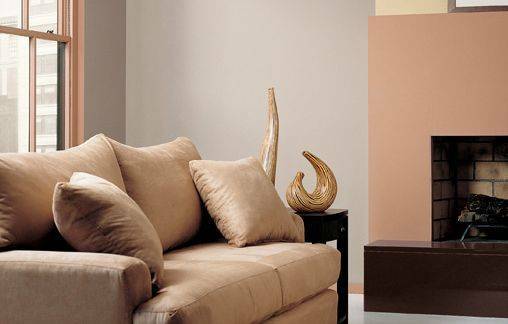 Furniture can maintain an organic feel with a linen or faux linen finish. Wood, stone and marble finishes also suit a space with an indoor fountain. The key is to pull elements from nature that add warmth to a room and fit with the flowing water theme. This doesn’t mean the entire room needs to be blue. It means taking things we commonly associate with nature and implementing them into the décor of a room. These are just some of the ways you can create décor that suits an indoor fountain. Remember that the style of décor you choose depends on the style of indoor fountain you have in the space. For those who choose a bubble wall with LED lights, an organic décor demeanor may be less relevant. In that case you can go with strong contrasting tones and modern furniture and finishing touches, such as abstract art and angular vases or lamps. Many commercial offices these days have a limited budget that doesn’t allow a lot of extra décor. Because of this, an indoor fountain is a great way to make an impact without investing too much money in extra decorating. Because of the statement indoor fountains and water walls make, they serve as the focal point of the look, allowing you to choose inexpensive furniture and paint for tying together the space.